Five categories of settings are related to the way you interact with or receive information from your BlackBerry PlayBook tablet: Keyboard, Screen, Sounds, Date & Time, and HDMI. You can also turn on or off keypress popup. When this is on (the default setting) every time you tap on a character in the keyboard you are rewarded with a brief enlarged and colorful version of the character just below your fingertip. It’s a good way to make sure you have hit the right character. If this bothers you, turn it off. Here you can customize settings for the screen when it runs from the battery, as well as when it’s plugged into a power source. Tap Plugged In to set your choices for that condition. You can adjust the brightness of the screen using a slider. 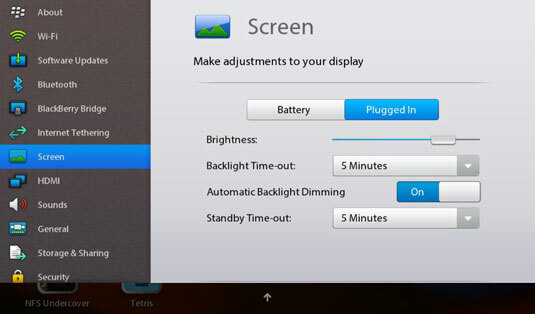 In the same panel you can also set the amount of time before the screen goes black when the system is idle (called backlight time-out), and the amount of time before the entire system goes into standby. Master Volume sets an overall level. 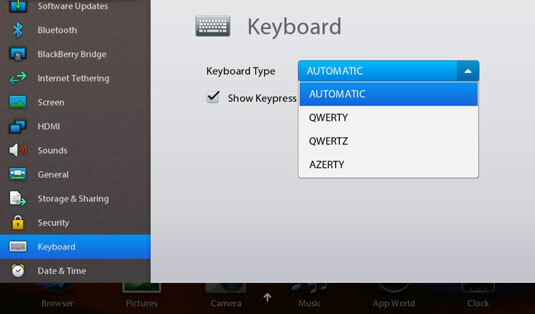 Keyboard Feedback adjusts the volume of the reassuring little clicks you hear as you use the virtual onscreen keyboard. Notifications sets the level for tones generated by messages, calendar events, and tasks. If you choose your local time zone and turn on Set Date and Time Automatically, the tablet keeps things up to the moment for you. You can also choose to use 24-hour time display (2330 means 11:30 p.m.). If you turn off the automatic setting, you can manually adjust the date and time. The High-Definition Multimedia Interface is a digital signal that can extract a stunning wall-sized image from your little BlackBerry PlayBook. This is a truly gee-whiz feature: you can connect to an HD flatscreen television, certain computers, and some LCD projectors. The signal can also carry audio. To use this feature, you need to buy a special cable that has a micro-HDMI connector at one end and a full-size HDMI connector at the other. You can get the cable from RIM or from most electronics stores. Once the cable is in place, the PlayBook detects the HD device and you can choose a display mode; choose the one that looks best on the system you’re using. The same goes for aspect ratio, which determines whether the image is stretched to fill the frame or adjusted with a zoom or fill; again, choose the one that looks best. One other choice, Default to Mirror Mode, determines whether the HD device shows exactly the same image as is seen on the PlayBook or whether you want to show one image on the tablet and another on the big screen. One example: displaying speaking notes on the PlayBook while using Slideshow To Go to project a PowerPoint presentation on the big screen. The HDMI output of the BlackBerry PlayBook is truly astounding, but it isn’t always perfectly compatible with every device; that’s probably not the fault of RIM, because high-definition displays have gone through many changes in their relatively brief existence. Some images generated by the PlayBook may not perfectly fill an HD display. 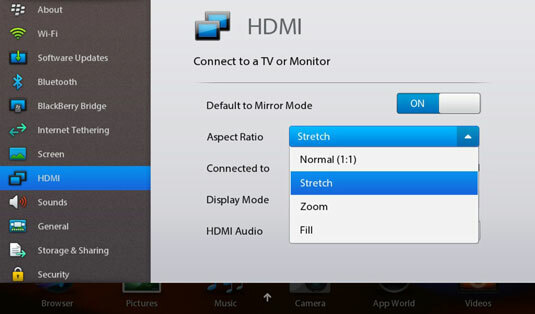 Make sure you use a good quality HDMI cable, and keep your PlayBook updated to take advantage of adjustments.